Shavout is a two- day Jewish holiday which celebrates the giving of Torah to Jews. Shavout 2018 will be celebrated from sunset on 19th May till nightfall on 21st May. It always falls fifty days after the second night of the Passover. The period of 49 days between Passover and Shavout is known as Omer. On this occasion, Jews celebrate the ripening of wheat and offer it to their God. Get into the festive mode and celebrate this harvest season of wheat with your loved ones by sending them warm Shavout wishes and greetings. 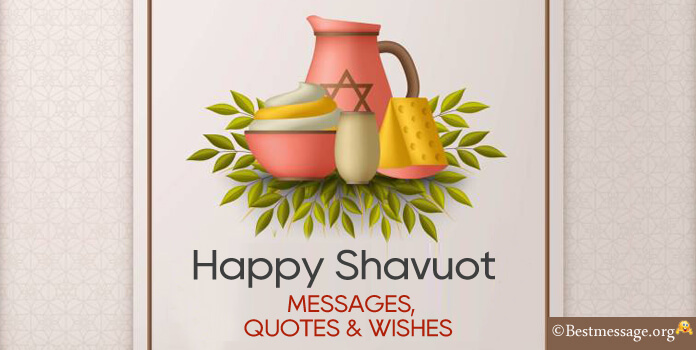 Say Happy Shavout to your family and friends on Whatsapp and Facebook with these lovely text messages and sayings crafted for this occasion. 1. Shavout is the day when the children of Israel got transformed into a nation…. It is on this day that we got a place which we can call our Motherland…. Let us celebrate this auspicious occasion with our family and friends…. Happy Shavout to you!!! 2. Time has come to offer our harvest to our God and seek his blessings…. Time has come to engage in celebrations and feasts with your loved ones…. Time has come to make it a time of enjoyment and festivities…. Sending warm wishes on Shavout to you and your family. 3. I wish that the first fruits of this harvest season bring to you a wonderful year along with the blessings of God… Wishing you an amazing year ahead and memorable celebrations to you and your loved ones on Shavout. 4. Let us thank Him for giving us a home, for giving us a homeland, for giving us a good harvest… Wishing you good health and prosperity, good fortune and success on the occasion of Shavout… May you are always blessed!!! 5. Blessed are we for God gave us a land to live and fields to harvest…. Let us celebrate the occasion of Shavout by offering the fruits of our hard work to Him and thank Him for his love and blessings…. Warm wishes to you on Shavout…. May you have a great festive time. 6. On the auspicious occasion of Shavout, I pray for happiness and health, prosperity and success for you and your loved one…. May this festive occasion bring along more reasons for you to smile and have a peaceful life…. Happy Shavout to you!!! 7. It is the love of God for all of us that we have a homeland blessed with prosperity….. Shavout is the time to offer him our harvest and express our gratitude towards him and seek his blessings for our family and friends…. Wishing you a happy and festive Shavout. 8. Shavout has arrived and festivities will soon begin…. Good times with loved ones, feast and celebrations with friends and offerings to God…. I wish you get busy in the best of the celebrations and have a memorable Shavout. 9. May God accept your offerings on Shavout and give you growth and prosperity….. May the coming year be full of new opportunities to grow and get success…. With lots of love and warm wishes, I greet you with a Happy Shavout. 10. Let us make this beautiful occasion of Shavout the most special one by organizing the biggest feast…. Let us gather our loved ones and enjoy the festive mood and mode…. Sending best wishes on Shavout to you…. May you have the best ever!! !